With halloween today, I figure what a great time to talk about some of the scary things about sports psychology. There are a few actually; so let me get right into it. While many people gain experience in the sports milieu as an athlete or coach, nobody is qualified to give advice in sports psychology unless you’ve earned at least a masters degree. Many qualified experts in the field thereafter associate themselves to relevant associations which enhance their credibility and refine their skills. Examples of such organization include the Canadian Sports Psychology Association (read more) / find a qualified expert in Quebec or in the United States the Association of Applied Sports Psychology (read more) / find a consultant. Sure, a coach can tell an athlete that they need to have a better attitude but, generally, may not tell them actually how to do this. This mental skill among many others should be taught by a qualified person in sports psychology. You wouldn’t get a plumber to do electrical work or vice versa so the same hold true here. If you really want to get the most out of someone’s performance hire a qualified person in the field of performance enhancement. I am not suggesting you get in touch with me necessarily (although I would welcome a new client and offer you a free 15 minutes consultation) but I would strongly suggest that you bring someone on your team who has studied this field and earned accredited qualifications. There are certainly many coaches who learn on the job and offer pretty good advice but when followed up with other questions related to performance, one cannot be guessing at answers especially what is the fastest and most efficient way of getting there. For whatever reason, many people feel they are properly equipped to offer advice to others but falling into this trap can get you face-to-face with zombies who may be lingering with other trolls six feet under the ground. My doctor has an interesting mug in his office that states “please do not confusion your google search with my medical degree”. Kind of frightening and appropriate if you ask me. Research has generally found that having no goals is worse then having some kind of goals. While it is nice to have a coach offer advice in sports psychology, it is certainly worse when no support at all is given in this critical part of the game. We know that having SMART goals (Specific, Measurable, Attainable, Realistic and Time-oriented) is a good acronym to use to remember how to set a goal but unfortunately, not many athletes actually write it down. It’s pretty scary to put so much emphasis on performance and NOT have a written plan. Not having a qualified sports psychology expert on your team is like having a haunted house but nobody to fix this problem. The performance can really suffer even more. In fact, it is always better to be proactive and work on this part of the game before underlying issues appear. Get into the habit of being grateful, see positive images and have sound goals. Sometimes a word can make all the difference. It does not have to be that foreign. I’ve recently re-launched a new course in self-talk in which I get my athletes to re-write negative statements into more positive ones by simply changing one word (see the preview). As kids ring the door bell this year and howler “trick or treat”, it has come to my attention that in the field of performance enhancement, we are generally accepting of the trial and error method. We’ve often used this method especially when solving math problems. By giving x a value and substituting a random value one can see if we have the right answer. Too much and we’ll subtract from the answer. Too little and we’ll just add more. By using a trial and error, the answer is eventually gotten but who has the time to practice by trial and error? In an ultra time sensitive field where nano seconds determine whether you get a medal or not, using this strategy certainly can be frightful. Let’s exaggerate a little and imagine the Olympic games whereby trial and error is used. Come back in four years the judge will ponder. Learning from one’s mistakes and gaining mental skills through competition is great but learning them before hand is best. This is where one of my most common pet peeve quotes comes into play. “Practice makes perfect” most people say but really, practice makes permanence as Martin Seligman once said. This means if you practice wrong you’ll eventually create a new learning pattern which will actually hurt your performance. So, while halloween comes and goes I recommend to take some time and really consider hiring a qualified expert in the field of sports psychology to improve your game. Doing this should not be a “one off” event but rather a continual process. Unfortunately, there is no magic pill and once cannot simply tap their heels and make the demons disappear. The consequences of not having a mental skills program can strike fear into even the most courageous athletes. Meanwhile, be safe out there and watch out for those kids! We want to make sure their athletic experience is not a scary experience. Boo! ​Failure, defeat and rejection. Nobody likes to talk about it but I’ll share my experience so that you can grow and learn from it. In pursuing my undergraduate education, I applied to various graduate programs. My first encounter with rejection came at the hands of McGill university. They ended up rejecting me five times. At first, it was as a ripe student fresh out of college. Let me describe how the first one felt. But before I do this, let me tell you what it takes to apply. The application process is tedious and time consuming. I guess that’s the least of your worries. Finding three letters of reference can be challenging considering they should be specific and tailored for the specific program. You need someone who will sign off on being generally accommodating and willing to constantly change the “to” field. It’s always a good idea to apply to more places than to fewer because you simply never know what fate lies ahead. I certainly would not anticipate getting an education can be so difficult. Each application cost on average $100 today and is sent with your pride on the line. When I got my first response from McGill, I was excited to see their logo on the envelope. The thin content, as I tore it open, can hopefully be succinct. Welcome and here is what you need to know. As I read through the letter, my heart skipped a beat. Actually quite a few beats as I was devastated. My hopes and aspirations were cut with a sharp knife. I asked all the wrong questions: why didn’t I get in? What did I do wrong? Why me? I felt hopeless and unmotivated. Albert Einstein was quoted saying that insanity is doing the same thing and expecting a different result. This by the way is the single most difficult concept my athletes have a hard time overcoming because you can do the same thing again and get a different result because in sports the other player or team may have played one of their best games. I certainly did try again. I did so because one study made me realize that when you don’t get what you want, trying again is simply one successful opportunity away. Past experience is not relevant. 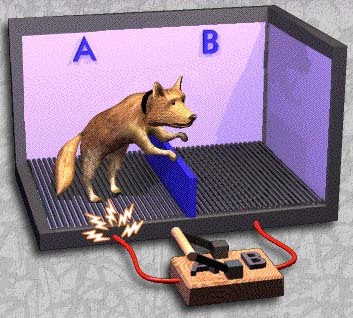 The study was performed by Martin Seligman and consists of observing dogs who have had averse experiences in the form of shocks delivered to their paws on a gate that the dogs were stepping on. The experience on dogs is no longer allowed but it did allow us to learn on the concept of motivation, persistence and resilience. The study had two sets of dogs prior to the shocks. One of them who were able to freely walk around a cage and another one who had a barrier preventing them to cross over the other side. The barrier would be higher than the picture below. The first thing you need to change is your mindset. For me, getting rejected meant that I must try again. Opportunity is only one yes away. I wanted to try again. The affirmation I use is that failure means I am more successful. As an analogy, think about the best baseball players in the world who fail at least 70% of the time and who are in the hall of fame. Failing 7,000 times means he’s succeeded 3000 times and by the way making millions of dollars. Thomas Edison who is recognized in trying over 10,000 times in developing the light bulb is a success story. Those who fail the most are the most successful. Don’t just stop failing at things once or twice. Do it many times and heck, enjoy the process along the way. The next thing you need to do is prepare yourself to fail. Understand that trying in itself is a process that is rewarding and enriching. Exercise the muscle of being resilient. Don’t take it personally. I also referee ice-hockey for more then 25 years and I can’t tell you the number of times I’ve been insulted, berated and put down on the ice. I tell myself they are yelling at the sweater. Listen to the criticism but don’t be threatened because it is an attack of your personality or who you are. I don’t like to ignore it either as it gives the appearance that you are superior. Think of the alternative of not trying. If you are 40 years old and still thinking of pursuing your passion, you can still have a good 25 years left of doing what you love to do. Imagine you are 20 years old simply attracted by making more money doing something rather then really enjoying what you are doing. Certainly, there is some pain along the road i.e. studying and jumping through needless hoops. However, my advice to you is to follow your passion. Listen to your heart. Enjoy what you do. What if you are 50 years old and tell yourself what a feeling it would be to pursue what you always wanted to do once and for all. If not now, then when? Stay the course and try again. Don’t just go through the routine of trying but totally absorb yourself in the situation and do it with conviction, heart and passion. Coach Doron is a sports psychology coach and helps people reach their goals. He can be reached at 514-963-FLOW (3569) or toll free 1877-778-FLOW (3569) via email at info@flowinsports.com or visit www.flowinsports.com He currently works with athletes from all kinds of sports and a range of talent from recreational to professional ever since he graduated in Sports Psychology from the University of Montreal in 2001. You’re training for the next marathon and are coming to the realization the importance of mental skills training. Some scholars as well as athletes have argued that it can influence up to 90% or more of the competition. But, how do you train the mental game? Much of your success runs (could not help but deliver this pun) within your ears. The most successful runners spend time training not only their physical skills but also their mental skills. We all want to be in flow – the state in which you are firing on all cylinders. This article is designed to inspire you to work on this very precise topic. Without further due: the 10 commandments of flow in sports for runners. To be clear, this is not something that you can have but rather the mindset that you must have. No matter the situation, no matter the circumstance, you must be 100% positive. Even if you did not perform as well as you think you should have, look at the positives. You are healthy, you can rebound and you will train to become better, faster and even stronger. Perhaps, this can be a good opportunity to feel what it is like NOT to be #1 so that when you surpass your best results then you’ll know both feelings. This will surely motivate you to work harder and focus on the positives. Enjoy the trail, the surroundings and gain a deeper satisfaction in knowing that you are doing everything possible in order to take your game to the next level. The difference between can’t and can is one letter. Similarly, the difference between your best run and your next one can be a slight adjustment in your mental skills – one that is more positive in which you interpret challenges as opportunities, setbacks as temporary roadblocks and slumps as a curve that will leapfrog you towards success. When the trail gets hard, this is when you work harder. It’s easy to be 70 or 80% positive but what about striving to be 90% positive. What really separates the best runners are those that can be 100% positive. It is worth repeating, 100% positive. No exceptions and no excuses. There is nothing worse than doing everything right but still not performing up to your own high expectation. The immediate knee – jerk reaction is to start from scratch and start all over again. Before you do that, look carefully at the process and not the results. Staying in the moment, being mentally tough, being persistent are key. Staying committed to your sport is the essential ingredient towards excellence. Continuing to train and work hard begins the very moment after the last marathon. It might begin with some of the sports psychology exercises outlined here and will surely lead to being more determined and even more disciplined in your approach of your sport. Avoid goals of time and placement. Replace it with enjoying your next training session. List 10 other process oriented tasks that will lead you to the podium. Quick start, strong finish, and a relentless desire to excel are good examples. Find 10 others. You should then create an auto-evaluation grid in which you compare your most successful performance to the one you just did. For example, if during an ideal performance state or when you were in flow the mental skill of confidence was 95% and upon reflection you were 75% confident during your last run, the goal is to get you 20% more confident the next time. May I suggest to create a confidence CV whereby you list the most successful competitions or events that you excelled in so that it can serve as a reminder tool. Although running seems like an individual sport to many, you can contribute to the greater society in more ways than one. Perhaps donate your older shoes for others to take up the sport. Offer yourself as a guest speaker to your local club and offer a few words of encouragement to younger aspiring runners. Follow up a month later and see how they are doing. Do some face-time so that this contribution is not only through email or phone correspondence. Lend a helping hand and volunteer. Donate whatever you can. We often forget those who donate the most enjoy it because it actually offers a great satisfaction to the donor. Thereafter, check-in to see your donations and how it has created an impact onto others. How many times has the most successful business owners, politicians and great inventors failed before being “successful”. Runners are no different. Understand that resilience is learned and is a trait of the most successful people and athletes. It’s your ability to shield negative influences and rise to the occasion. Exercise your flexibility. If you have not reached your goals as soon as you wanted, then make some adjustments and continue trotting towards your objectives. What is paramount is that you are learning from your mistakes. The tricky part is to accurately pair up your behavior and the results in distinguishing what is working and what is not. Being professional means taking responsibility for your actions. No need to tell everyone your peaks and valleys. Stay humble in your success and understand that poor results are only a temporary setback. Even if you did not place as high as you wanted, ask yourself the right questions. What did you learn from this race? What can you do better? The answer surely lies within you. What went well? What needs improving? What is the difference your best run and one of your worst? You might notice that you were more focused, optimistic, had better training and or other circumstances led to a better performance. The key is to mimic the good ingredients and to slightly modify the poor ingredients so that your recipe of success gets you to the finish line faster. The fact that you are reading this article is a great step in the right direction because you may realize that building your mental skills is an art in itself. It takes time and effort. Precisely, mental effort. However, this is the path in which you are working on your mental skills. The question is are you setting aside a daily or at the very least a weekly block of time to work on your mental skills? While many of your peers may be going to their 9-5 jobs, your schedule is different. It starts earlier and ends later. It is more demanding and requires much more discipline. At times, the steep can feel unbearable. However, stay the course. Continue to log the hours. Keep in mind the 10,000 hours of practice rule (google it). With all this experience, you can be considered an expert in your field. Imagine not only working in the field but smiling at the same time. Enjoy the run. Relish the moment. Truly, absorb yourself in your situation and allow yourself to be happy along the way. Your fellow runners will surely appreciate that you are in this field for the long haul and not just for a year or two. So you missed your latest workout, had some cheat food or just not feeling it right now. What to do? Certainty, every action has a consequence. Also keep in mind, every non-action also has a consequence. This commandment reminds you that you have a responsibility – a purpose in each practice, run and marathon. Understand your why. Why are you running? What is your goal and avoid the answer of beating your best time or striving to place a certain number. These are all outcome goals and it is imperative that you focus on the deeper reason as to why you are running. It is good to run to have fun. It is better to do it for the enjoyment it provides. Get into more depth. Provide details. Define your cause. Being inspired and competing in honor of someone can surely provide a short-term boost but the focus should be in the long run. Many of the top athletes know what they do, how they do it but why? Understand your why. Look at the classic Simon Senik Ted Talk to get you thinking of why you begin each day training and running. Believing in your sport can spread into a wide spectrum. 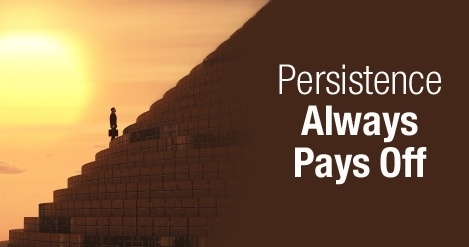 On the one hand, you might truly believe beyond a shadow of a doubt in all your efforts and work. However, you may also have doubt. You probably are somewhere in between but the idea is to develop and cultivate this belief. There are many good and bad things that are happening to you along the way to get the famous “runner’s high”. A good thing can be an event that leads towards success such as you are feeling pumped up for a practice or the race. In contrast, a bad thing is an event that produces the opposite reaction such as you are feeling sore or you had a bad training day. Realize that good things can last a long time and bad things last a short period of time. Good things should affect many areas of your life (practice field, work realm, family life etc.) while bad things should affect few. Take responsibility for good things while blame or find a reason as to why things did not go your way. Optimistic people live longer and are more successful in their sport. No doubt, a sense of realism is required as we simply cannot blame someone or something every time something goes wrong. Commandment #9: Follow Instructions, Learn from a Combination of a) Experience, b) Others and c) Mistakes While Staying the Course Despite Distractions and Setbacks. This one is a shoe full or should I say a mouthful. Instructions you are receiving may be from a variety of expert sources in the field: a dietitian, a physical conditioning coach and of course a sports psychology coach. Don’t just do some of the exercises. Do them all! Imagine you took a binder with loose leaf and did all the exercises outlined in this article? If your coach gives you instructions, follow them religiously. Be open and embrace change. Despite the myriad distractions available, zoom in on your goals and don’t let anyone else or anything change your mind. A setback should be viewed as merely a pebble on the road in which you will crush with your feet. This is your time to think about one of the commandments that you live and die by. What values do you cherish? What would you recommend? How will you phrase this commandment? Look over the first nine and see which gaps I have left in your success to be the fastest runner possible. Enjoy it. I am positive you can do it. If you are enjoying the commandments, I have built a course which further solidifies your understanding of these pillars of excellence. 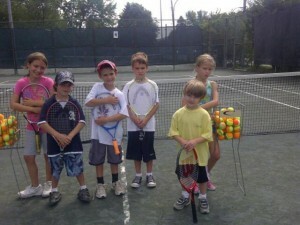 I invite you to look for them at www.flowinsports.com/courses . Anyone who wants to enroll in a course can do so for free until the end of 2015 for free. Simply mention this article. In addition, the commandments were discussed on a radio with Dr. Syd Miller a leader in the psychiatric field in Montreal, Canada. The title of the show had to do with Olympic mindset. To listen to the entire show, click here and look for the radio interview. NHL Lockout can have Long Term Consequences. Repercussions can be catasrophic causing a seismic shift in the economy. Imagine watching NHL games in Europe on a permanent basis. If the NHL and the NHLPA do not come to terms on how to split the reported 3.3 billion dollars (and less every day) that the league is generating as of the 2011-2012 season, the long term consequences can be devastating. As you know your careers are limited to an average of 5-6 seasons. Keep in mind that about 50% of all NHL players play less that 100 games during their career and for approximately five percent of players, their first NHL game is also their last! Losing one season is like losing 20% of your livelihood. It’s huge. As a lockout drags on, many more will choose to migrate (or return) and play in Europe. Once a full year of this scenario plays out, many more will “join the club”. Imagine year two and three. Is this really where you want to live your life? Hockey players train to play. Hockey is their life. They see no other means to make a career although many will eventually contribute in society and make a modest living doing speeches, charity work and eventually integrate in what the rest of us do to make ends meet. I’ve had multimillion dollar athletes in my office who, break down claiming they have lost what is considered the single most important mental aspect in sports such as confidence (show me a course in confidence), can have super inflated egos that will go to great lengths just to prove their point. These players are highly intelligent and competitive and are approaching a point in which they may just want to win their cause at all costs. Remember a time when you were fighting with your partner and forgot what the argument was about? My advice to to players is to concede. You’ll need to put things in perspective. At some point, you will need to rationalize I made 1.5 million last year and for 1.2 million this year, I’ll have to go through the same grind and get paid less. Do it for the fans who will respect you for your humbleness. As buildings remain underutilized, they are starting to feel the pinch. Rental, fixed expenses and a lavish lifestyle eventually catches up to everyone. Imagine the long term ramifications. Many of your currently employees are off to Europe and although the fans over there cannot afford the ticket prices and salary of current NHL standards with each passing year, the gap will be closer. As the public begins to appreciate and understand the value of hockey, ticket prices will slowly increase which will result in more lucrative contracts to the players. On the flip side, at least as fans in Europe they’ll be able to buy a game 7 NHL “Staley Cup” playoff ticket for 20 euros. As more players come to terms that the second season will not take place settle and build a family in Europe. The entertainment value the game exudes continues to surpass expectations. The rinks are getting full and the realization that building bigger arenas is trickling up to government who also see an opportunity for fame and fortune. Owners in Europe will seize the opportunity and deliver more and more perks that North American players have enjoyed. Sponsors see the return on their investment and they join forces to heighten the value of the game we once called Canada’s game. The same high standards that North American rinks have enjoyed are slowly being replicated in Europe. The new new NHL is now in Europe! Kids grow up watching games and Hockey Night in Canada is replaced with Hockey Night in Russia, Copenhagen and Sweden. The TV network has now cashed in on the ratings. The hockey business grows and more fans settle in and purchase the same material and consume the goods and services that they did in North America. Meanwhile, while one economy flourishes the Canadian and American economy deepens into recession. A significant increase in the amount of Europeans learning, watching and coaching hockey is developing. My advice to owners is to concede. Do it for the fans and they’ll appreciate it by coming back in even larger numbers than before. Do it now. Otherwise, for both the players and owners, it will be too late. Lior Doron is a sports psychology coach and has over 15 years of expeince working with amateur (show me a package) and professional (show me a package) athletes on peak performance in sports. He also earned a graduate diploma in sports administration from Concordia’s John Molson School of Business. He can be contacted toll free at 1877-778-FLOW (3569), locally at 514-963-FLOW or via email at ldoron@flowinsports.com. Ask for a free sports psychology 15 minute consultation or get a free e-learning course (show me them all) valid until December 15th 2012 for free. Just fill out the free information request on the website menitioning this ad. The game is on the line and your child can either be the first star or the scapegoat. You want to help your child perform their best and you’ve done everything in your power to provide the best possible chances of success. One area you may have not put much thought in is investing is the area of mental skills training for your kids. You’ve heard of the notion that playing sports is 90% or more mental but what is sports psychology anyway? Sports psychology involves the instruction and training of psychological skills for performance enhancement. It involves helping an athlete get into a state of flow or peak performance. But how can we get there? When the pressure is on, what exactly should one be thinking about? Can victory be enhanced with the thoughts of winning? If so, what are the best key-words to use? When you strive to achieve a goal, we are often taught to think about it long and hard and it will eventually happen. Perhaps you’ve heard about the self-fulfilling prophecy whereby the thoughts that you think about lead to the occurrence of the event. The rationale is that the belief causes the behavior. In sports psychology however, when it comes down to winning, the idea is to think about what it takes to win rather than the actual victory itself. In a nutshell, think process vs. outcome. One needs to think about being “in the moment” being “right here right now” or other cues such as “focus”, “calm” or “persistence”. Sports psychology experts generally agree on core values in success as belief, commitment, mental toughness and confidence. Other thoughts that lead to victory can be to think about the enjoyment of the sport, being resilient or to have a second or third effort. When thinking of positive sports psychology words fun is a good word. Enjoyment is better. Personal satisfaction goes even further in creating the psychological characteristics of peak performance. Take a look at this clip of campers saying to themselves I can (see it) or see it with an instructor (see it). As athletes move up in competitive settings, thinking of more meaningful, creative and sophisticated words can help their performance so that they can succeed “in the clutch” and hopefully they’ll recognize your wise words of support. Lior Doron is the academy director of the tennis and sports psychology academy (TSPA) which specializes in positive reinforcement and trains campers on and off the court. More information on the camp click here, visit the academy’s website www.tspa.ca or by calling 514-886-9929, info@tspa.ca. He also owns Flow in Sports which helps athletes train mentally for peak performance. For more information, please contact him directly at info@flowinsports.com, toll free at 1877-778-FLOW, 514-963-FLOW (3569) or visit www.flowinsports.com. Focus on the Positives to Achieve Better Performances Coach Doron B.A., D.S.A., M.Sc. · Rather, then booing poor performances, unconditionally support your team. Rain or shine let them hear it, see it and feel it. · Sing the “Ole Ole” every home game even when the team is losing. What a great feeling it is to be happy when things are not going well. One would be amazed how fast things can turn around with this perspective. · After a goal scored upon the Habs, immediately start chanting « Go Habs Go ». Athletes are more prone to success with support vs. conditional acceptance especially in a city where the athletes are backed up only when they win. Wouldn’t it be great to focus on what can we do to reboud back after an unsuccessful event? Why not right here, right now? · The media can accentuate the positives of each games (even when a team loses) to create a path of success vs. what is going wrong. No doubt, I am not in denial. Players need to step up especially those whose primarily roles is to put the puck across the goal line. · Print out fresh new articles on the players so that the fans can really get to know them. · Highlight the many gestures the team does for the less fortunate. · Provide management with other ideas on how their team and brand can help. Look on the bright side and shift your lens. · Having read focusing on the positives in the Montreal Gazette, what about similar uplifting feel good stories every week about the players. · Stop focusing on the coach’s language skills (or lack-of) and allow him to work in an environment that embraces his skills and knowledge. He certainly earned it. It is always easy to second guess and play arm chair quarterback. The term is called the knew it all along effect. For now, let things unfold and simply describe the events without passing judgement. · Step up efforts for scouting the best players around the world. Stop reminiscing about past performances and take the steps necessary so that you can help the team now and for years to come. 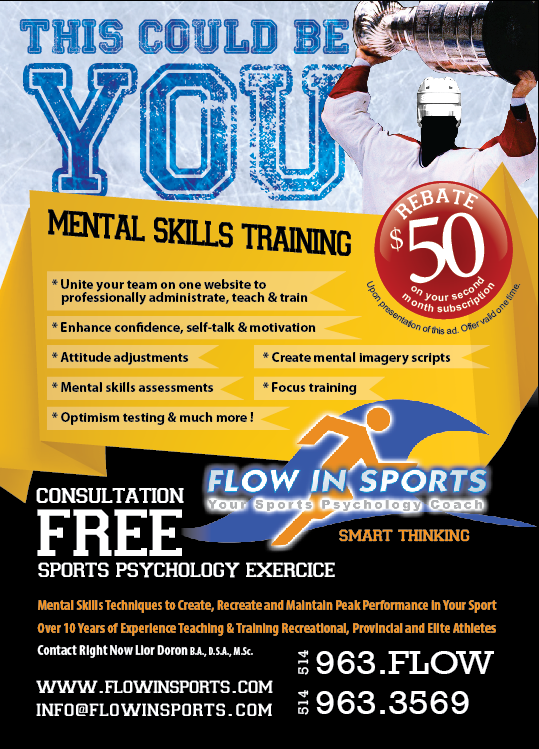 · Increase the value of the psychological factors that a player can bring on the ice. Remember a player with less talent but who has superior mental skills is far better off for the club. Evaluate they psychological attributes of commitment, team play, mental toughness and ensure the player is dedicated to the city. 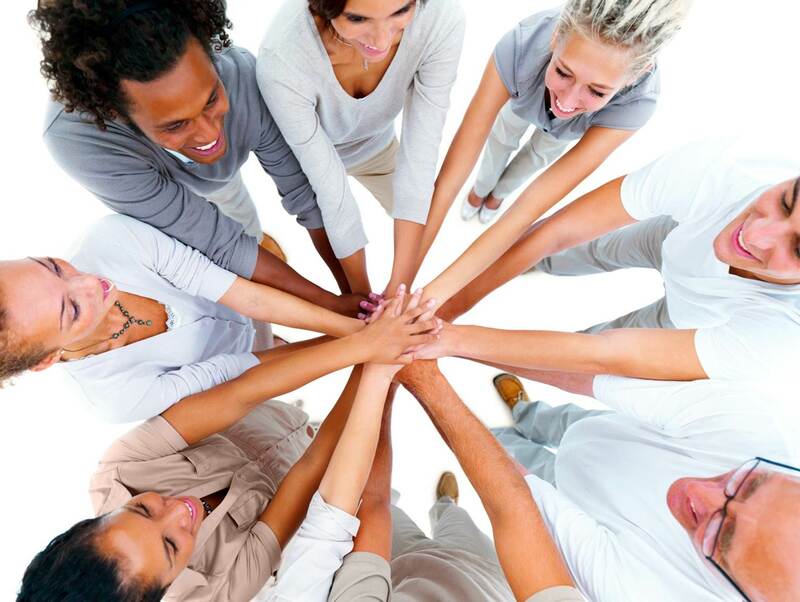 Team workshops (read more) that focus precisely in these areas can serve as valuable building blocks for success. This approach has certainly helped young kids build their mental skills while playing sports (read more). · The team is searching for its identify with the recent changes in coaching staff and players. This is a similar team that was one goal away from beating the Stanley Cup champions Bruins in the deciding game 7 in 2011. Are you making a change for the sake of change or does the change have a clear purpose? · Focus on bringing back their game to the basics as the cliché goes “keeping it simple”. Home games don’t need to be so entertaining. Local fans also enjoy those dirty goals. · Enjoy playing in the best National Hockey League city as this is truly a once in a lifetime experience. Focus on the process, savour it and be in the moment. The results will follow shortly. · Trust your skills. You’ve done your moves thousands of times in practice and in your mind. Allow yourself the freedom to express yourself even if this means you might make a mistake. Follow or Like Us and Get 10 Coupons! Suivez or Aimez Nous et Recevrez 10 Coupons! I wanted to take a few moments to wish you and your family a wonderful holiday season. Wishing you only the best of the best! I also wanted to share with you three new developments and holiday specials that are in effect until January 15, 2012. 2. Get Sports Psychology Services in School for $0 + 50% off TSPA (Tennis and Sports Psychology) Camp for the Entire School + 100 coupons! Second, by having your school offer leading edge sports psychology services (tell me more), I am pleased to share a new grant from the provincial government that will cost your school $0. A team can benefit from mental skills training off the court to boost performance on the court. Once the Flow in Sports for Teams Gold Package is purchased the entire school will get 50% off the regular price of our world famous TSPA tennis camp! You can decide by June 2012 which week(s) the camper will participate. If you are the primary reason creating this worthwhile partnership, you get 100 coupons! Just forward this email to the school administrator (more info) and ask him or her to (download the bursary form). See top 10 videos and pictures from TSPA summer camp 2011. 3. New Ad: This Can Be You! Any questions,comments or suggestions, feel free to contact me. Je saisis cette opportunité pour vous souhaiter à tous de joyeuses fêtes avec vos proches! Je voudras aussi partager avec vous trois bonnes nouvelles ainsi que et des spéciaux en vigueur jusq’au 15 janvier 2012. Un nouveau site amélioré. Vous pouvez voir les services que j’offre dans les cases oranges. Pour tout achat, recevez 50 coupons; ceci inclut des leçons de soutien scolaire et des cours en ligne d’optimisme pour enfants et adultes, motivation, focus, imagerie mentale ainsi qu’un examen de hockey sur glace pour les arbitres. À la découverte du nouveau site à l’aise en sport! 2. 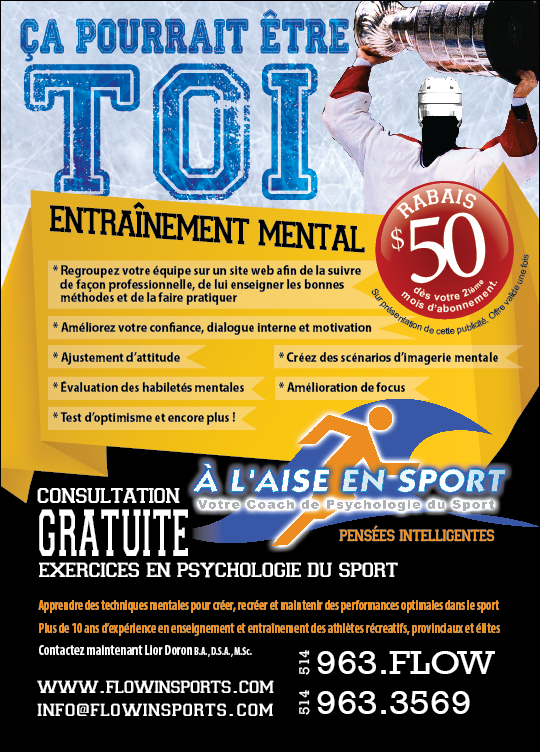 Service en Psychologie du Sport dans Votre École Pour 0$ et 50% de Rabais Pour le Camp ATPS (Académie de Tennis et de Psychologie du Sport) Pour Toute L’école et 100 Coupons! Lorsque votre école offre des services en psychologie du sport (en savoir plus), j’ai le plaisir de vous annoncer que le gouvernement provincial offre une nouvelle bourse qui ne coûtera rien à votre école. Une équipe peut bénéficier d’entraînements mentaux en dehors du terrain alors que sa performance peut s’améliorer sur le terrain. Dès que vous achetez un forfait d’équipe “or”, l’école bénéficie de 50% de rabais sur le prix régulier de notre camp d’été ATPS. Vous avez le choix de vous inscrire aux semaines de camp de votre choix jusqu’en juin 2012. Si, grâce à vous, un partenaria se forme entre à l’aise en sport et votre école, vous obtiendrez 100 coupons! En shouaitant que ce couriel soit transmis au responsable de l’école (en savoir plus et télécharger le formulaire de bourse). Regardez un vidèo sur l’imagerie mentale et vous verrez le pouvoir que celle-ci génére sur les individus. En cliquant ici regardez les 10 meilleurs moments et vidéos. Finalement, je voulais vous introduire à ma dernière publicité. Pour toutes questions, suggestions et commentaires, je suis à votre disponsition. Want to team up with Flow in Sports? Get at least 70% return on your investment. Sponsorship Opportunities Exist. Click here for more info. Vous aimeriez être coéquipier avec à l’aise en sports? Au moins 70% retour sur votre investissement. Possibilités de commandite. Clique ici pour plus d’information. Виктор on NHL Lockout can have Long Term Consequences. Repercussions can be catasrophic causing a seismic shift in the economy. 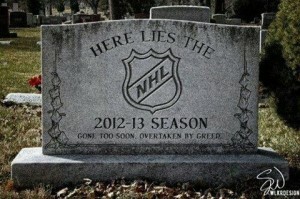 EZSolution on NHL Lockout can have Long Term Consequences. Repercussions can be catasrophic causing a seismic shift in the economy.